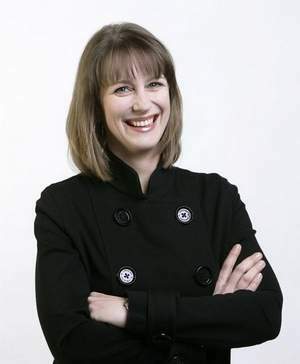 Eugene Fisk, who now publishes a blog called Unigov, has accused Indianapolis Star publisher Karen Crotchfelt of engaging in a violation of journalistic ethics by her involvement with a political advocacy group. I quote from his response to Gannett Chief Ethics Officer Barbara Wall and Star Editor Jeff Taylor struggling to defend Ms. Crotchfelt's political activities. First I would like to thank Ms Wall and Mr. Taylor for replying to the prior complaints. I disagree on a couple points and if you will bear with me I will refine my message, by focusing mainly on two issues - the mass transit plan, and the IMS (Speedway) funding plan. "In that spirit, we’ll meet with individual legislators over the course of the coming year to answer their questions and secure bipartisan support for the plan. We'll engage the strong grassroots network that already exists to build even broader community support. And we'll continue gathering feedback to refine the transit plan as necessary to meet the community's needs." The Star has overwhelmingly supported the mass transit plan; Ms Crotchfelt belongs to a group that lobbies for passage of the mass transit plan. Do these things go together ? Is it Ms. Crotchfelt's role within the CICP to make sure the Star's coverage of this issue agrees with the CICP agenda ? Is being a member of the board of directors of a powerful lobbying group, an "impartial arms’ length relationship" ? Why would the president of a newspaper be so embedded with a lobbying group ? The mass transit plan isn't "food for starving orphans", it's quite a contentious matter, one many people see as a waste of money, a redirection of scarce funding toward white suburbia, and yet another example of corporate welfare. Yet the Star's coverage appears to be dictated by the CICP. • On February 11, 2013 the IMS funding bill was substituted into a "vehicle bill" in the Indiana Senate. • That morning, prior to the Senate's action, the Star ran the pro-IMS article "Speedway has earned a break" by Dan Carpenter. • That evening two news articles appeared on the USA Today site from Star reporters, each presenting the IMS point of view. • On February 14 the first Senate committee vote was scheduled. • That morning, prior to the Senate's action, the Star ran the pro-IMS article "Speedway's request for taxing district should get green flag" by Matthew Tully. It is difficult to believe that the timing of these events was a coincidence. It is difficult to believe that two Star opinion columnists whose other writing is quite liberal, would suddenly decide to craft heartfelt articles in praise of corporate welfare for IMS. And again it is difficult to believe that the Star president's membership on the board of directors of a lobbying group had nothing to do with the Star's coverage of this issue. Even the Star's straight news coverage during the pivotal mid-February blitz was pro-IMS. The Star left out the ongoing effort by IMS to be sold or bought out, a negative for IMS. The Star included a flat-out lie by Senator Luke Kenley, that the IMS funding plan would turn a profit for the state - the General Assembly's own economic impact document says no such thing. So on both the mass transit and IMS funding plans, the Star's coverage was exactly what the CICP would have wanted. Hard to accept this as a coincidence. As the mass transit plan works its way through the General Assembly, other Star writers have pitched in with consistently fawning support. On a local blog today I read that Erika Smith has published seven pro-transit articles in the past five weeks. 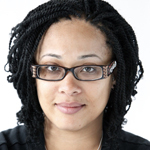 (Editor's Note: she has written on the topic in four of her last five columns.) Star opinion and news appear to combine in service of the CICP. I suggest Star news coverage and opinion is largely dictated by CICP, or else we have a string of amazing coincidences, and that Ms Crotchfelt's and Mr. Ryerson's membership on the CICP board of directors is less than the "arm's length" required by the Gannett Ethics Policy. Fisk makes a very persuasive case that Crotchfelt is in violation of the conflict of interest provision in Gannett Ethics Policy, Part II, Paragraph C. There is simply no excuse for her involvement in CICP. Even more importantly, Fisk makes a very persuasive case that Crotchfelt has allowed her conflicts to influence how the Indianapolis Star covers the mass transit and IMS issues among others. At the very least, Ms. Crotchfelt should be required to resign from CICP. I know a lot of former Indianapolis Star readers would welcome her and Mr. Taylor resigning altogether from the Star given the paper's continued decline in quality and their refusal to have the Star act as a watchdog for local government. Tuesday, February 26, 2013,The Indianapolis Star's Content Declines in Quality Under New Leadership Team; Is Indianapolis in Danger of Losing its Daily Newspaper? Wedensday, February, 26, 2013, The Star as a sellout, by Eugene Fisk, written by blogger Ruth Holladay. Paul Campos, law professor at the University of Colorado at Boulder, on Wednesday announced he is ending his blog, Inside the Law School Scam. The blog took a harsh look at the value of a law school education and criticized the manner in which law schools lure naive young men and women into going to law school only to leave school three years later with enormous debt and few, if any, employment prospects. I started [this blog] because I had something to say, and this seemed a good way of saying it. For a few days I wrote anonymously – something I had never done before – more as a stylistic experiment than anything else. But naturally people in legal academia instantly became more concerned with Who Was Saying These Outrageous Things than in whether those things might actually be true. So I dropped the mask -- which ensured that a few of those people would busy themselves henceforth with irrelevant personal attacks, rather than substantive responses. Indeed Prof. Campos is spot on right. Several years ago, I raised the point that law schools were lying about their published employment numbers in order to fraudulently entice students to go to school. The saturated legal job market, including the low employment and salaries (should a new attorney be so lucky to get a salaried job...now many jobs are commission only) has only gotten worse since then. I, like Prof. Campos, felt like I was a lone wolf crying in the woods when I was trying to warn people about going to law school. Now, less than a decade later, I feel vindicated. Indeed what Prof. Campos now called "conventional wisdom" has led to a dramatic decline in the applicants to law school, although not surprisingly the greedy law schools continue to crank out the same level of graduates. I’ve never written anything about the professional and personal price I ended up paying for starting to investigate, more than a year before I began this blog, the structure of contemporary American legal education. Perhaps I’ll tell that story someday. For now I’ll merely note that if people enjoying the extraordinary protections afforded by tenure aren’t willing to confront institutional corruption, then academic tenure is an indefensible privilege. People have asked me how I can continue to be on a law faculty, given my views. This question – when it isn’t simply a hostile attempt to derail conversation – is based on a misunderstanding. I very much believe in the potential value of higher education. And I believe that legal education can and must be reformed radically. (On one level the most important short-term reforms couldn’t be simpler: the cost of law school attendance must be reduced drastically, and the number of people graduating from law school must be decreased by a significant amount. In the longer term, the American legal system will need to confront whether it is either pedagogically justifiable or financially viable to continue to require the basic law degree to be acquired through postgraduate education). In some very concrete, practical ways, reform is much easier to achieve from the inside. I’m proud of the fact that, as of this coming fall, my law school is on track to have cut tuition in real dollar terms over the past two years – something which perhaps no other ABA law school will be able to claim. I’m proud that CU Law School, which two years ago was publicizing highly inaccurate employment information, is now one of the most transparent schools in the country on this score. I don’t happen to believe that I would be more effective working for reform as an ex-law professor. Still, even if I did believe this, I’m well aware I wouldn’t have the moral courage to quit. That makes my belief suspiciously convenient -- but it doesn’t make it false. In any case, reform driven by forces both outside and inside the law school establishment is essential, and it’s beginning to happen. I would like to thank you for writing this blog. This time last year I was planning on applying to law school thinking that being a lawyer was a sure way to a stable and lucrative career. After suffering 5 months of LSAT prep, taking the test this past October and December and sending out applications, I discovered this blog just as it was about time to seek out how to finance my potential law school career. The statistics you provided and the posts by recent graduates and unemployed attorneys were alarming. Needless to say, I have since changed my mind on attending law school seeing that it is a losing proposition. I would like to thank you for giving me information that helped me avoid a $175,000 mistake. Yes, thank you Prof. Campos for your courage to stand up to your fellow members of the legal academia and tell the truth to young men and women considering a career in the law. HB 1483, a bill that would require recipients of Temporary Assistance for Needy Families (TANF) to take written drug tests, recently passed the House 78-17. Supposedly the written test is more than 94% accurate at predicting who is abusing drugs. (I don't buy that.) People who flunk the written test then are subject to taking a regular drug test which could eventually lead to a loss of benefits if drug use is confirmed and continues despite counseling. I am not fond of such tests. They catch very few people, are incredibly expensive, and you have the problem of false positives which require additional testing. In Florida only 3% of the welfare applicants failed the test. Supposedly the program will only cost Hoosiers $500,000 but save $1.5 million. I think that's wildly optimistic. I'm fairly certain the figure doesn't take into effect the inevitable legal challenge. As the government would be running the program, it is subject to the Fourth Amendment's Search and Seizure clause. Requiring someone to take a drug test generally requires some sort of probable cause or, at the least, reasonable suspicion of drug use. In Florida, a federal judge found the law unconstitutional. I'm sure the inevitable legal challenge will cut into that projected $1 million savings. But if we're going down that road, why not include all welfare, including corporate welfare? The maximum benefit payment from Indiana's TANF program for a family of four is $346 a month. We hand out a lot more money in corporate welfare, after all, than we do poor people welfare. An example is the Pacers. Every year we give the team's owner, billionaire Herb Simon, $10 million to operate taxpayer owned Bankers Life Fieldhouse. In return, the Pacers get 100% of the basketball and non-basketball revenue from the building and get to play at the Fieldhouse for free. How many tens of millions of dollars is that subsidy worth? It's a heck of a lot more than $346 a month. How do we know corporate welfare recipients are not spending the money we give them on drugs? Look at how much money the Colts gets from the state and City of Indianapolis. Why not drug test Colts owner Jim Irsay? Given his alleged history of prescription drug abuse that made the headlines a few years ago, those test results would be pretty interesting. Why not test the board that runs the Indianapolis Motor Speedway and is currently lobbying for a subsidy? What about the nonprofits, entities like the Indiana Sports Corporation, Indianapolis Downtown, Inc., and the Arts Council of Indianapolis? They regularly receive a big pile of our tax dollars so why shouldn't their board members be screened for drugs? Or how about the for profits - those companies which receive subsidies or tax breaks from the City of Indianapolis or State of Indiana to locate or continue operating in our community? How do we know that their CEOs and board members are not using our tax dollars to buy illegal drugs? By including corporate welfare, the drug testing program would go from almost certain failure to almost certain success. I guarantee you we would have catch a lot more drug users than 3% and save a lot more than $1.5 million. Of course that's not going to happen because the people who receive corporate welfare receive it because they have one thing that poor people do not have - political power. They will make certain that this law that would apply to poor people never gets applied to them. The Indianapolis Star's Content Declines in Quality Under New Leadership Team; Is Indianapolis in Danger of Losing its Daily Newspaper? In 2010, Star Media, owned by media giant Gannett, made what it claimed was a bold move to shore up the falling circulation of the Indianapolis Star. 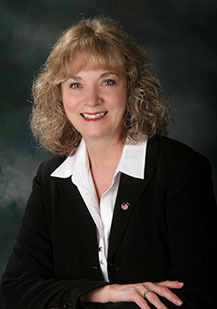 Karen Crotchfelt was appointed as publisher. 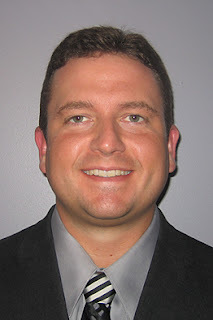 Earlier in the year, Jeff Taylor was appointed Editor in Chief. 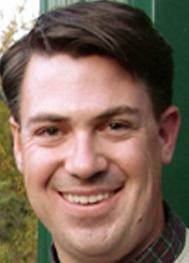 Crotchfelt replaced Michael Kane while Taylor replaced long-time Editor Dennis Ryerson. Still I held out hope that the Star would improve its content and watchdog functions under the Crotchfelt/Taylor leadership. I thought perhaps they were merely making statements that didn't criticize their predecessors, while planning to strengthen the paper's content. Indeed since the Crotchfelt/Taylor team took over indeed the content of the Indianapolis Star has changed. It has gotten much worse. That new team managed to take a fledgling daily newspaper with little local content and make it even more irrelevant to readers. That Crotchfelt and Taylor could actually accomplish this considering how low the bar had been set by their predecessor, is a remarkable feat...but in a bad way, of course. Does Crotchfelt and Taylor really believe that readers are clammoring to read yet another Erika Smith column on mass transit? Of course they don't believe that. They simply do not care what the readers want. Their philosophy is that the newspaper is the arm of the local government and the business interests, promoting their agenda at every turn. What the public will actually pay to read is unimportant. Crotchfelt and Taylor's position is that if readers want investigative, original reporting, they can read the blogs or buy a copy of the Indianapolis Business Journal. It's not the Star's job to do critical reporting on local issues. I don't blame the Star reporters. Writers like Jon Murray and Tim Evans are very talented. The Star is fully capable of doing in-depth investigative reporting if the editors allow the reporters to do their job.. For example, when it came to reporting on problems with Department of Child Services and issues relating to I-69 land purchases, the Star led the way. But those are the exceptions to the rule for our daily newspapers. And when it comes to investigatory pieces regarding Indianapolis local government and the business and political insiders they serve, the Star's investigatory reporting is nowhere in sight. Think you're going to read in the Indianapolis Star a critical story about the Broad Ripple Parking Garage giveaway or the Pacers $33.5 million (now $44.5 million) gift or the insiders cashing in on certain development deals at the expense of taxpayers? Not going to happen. When given a chance to cover a public corruption trial involving a politically-connected real estate broker whose deals involved prominent local officials, the Indianapolis Star unbelievably took a pass. John Bales' trial and subsequent acquittal was never once mentioned in the Star. Unbelievable. I can't see the Star surviving as a daily print publication much longer. Last Fall, New Orleans became the first major United States City to lose its daily newspaper. It appears that Indianapolis, which has a substantially larger population, is on its way to becoming the second. Privatization has long been advocated by many conservatives as a good government measure. Traditionally, privatization was used a tool that subjects government monopolies to competition from the marketplace, driving down costs and improving quality of service. Privatization pioneer Steve Goldsmith, former mayor of Indianapolis and now deputy mayor of New York City, used to apply what he called the “Yellow Pages test.” If he could open the Yellow Pages and find several companies providing a service, he wondered why government should be in that business. As Mayor, Goldsmith privatized dozens of city services in Indianapolis, saving the city an estimated $120 million the process. This ranged from contracting out services, to forming a public/private partnership to implement a $500 million infrastructure improvement plan to hiring private managers to run – but not own or lease – the airport and water utility. Today, sadly, privatization is less about Goldsmith style operational effectiveness and more about providing jackpots for financiers who stand at the core of a growing privatization-industrial complex. Cities and states salivate over ways to sell or lease off underperforming public asset for large payouts. With local governments cash-strapped and the public unwilling to pay more in taxes, it is politically difficult to even bring user fees to a market rate. Combined with the potential billions in payoffs – Indiana received $3.9 billion for its toll road and Chicago $1.1 billion for its parking meter system – the appeal is obvious. But these transactions differ markedly from the Goldsmith-style privatization. They are driven not by efficiencies but by an investment banker mindset focus on money and narrow parameters of the asset operations. They also provide enormous temptation to elected officials to grab the money now even at the expense of future generations. They are also rife with potential conflicts of interest and incentive problems. One major source of conflict comes with the professional advisors that drive the deals. Since long term leases involve so much money and are so complex, they require millions of dollars of services from investment banks, lawyers, financial advisors, etc. Unlike for typical government transactions ... the vast majority of cities have little in house expertise for complex financial transactions. Thus local officials are at the mercy of these out of town experts to give them the best advice they need to defend the public’s interest. But what advice can we expect from these firms, who have a stake on highly leveraged deals? The people in the firm may be technically competent and possess the highest levels of personal integrity, but still are prisoners of a structural conflict of interest in promoting privatization transactions. If you make money on privatization transactions, then no deals means no money. So obviously these firms have every reason in the world to promote privatization and see deals go through regardless of whether any particular deal is good or not. This doesn’t mean they are crooks, it’s just the reality. These firms now form of the core of the “privatization-industrial complex” with an incentive to cheerlead for leading public assets because that’s how they make their money. They need deal flow, the more transactions the better. This is frequently combined with traditional clout driven contracting. Many of the Chicago parking meter firms had tight links to the Daley administration. Daley himself became a partner in the law firm that was the city’s legal advisor on the meter deal after leaving office. Similarly, in Indianapolis a city-paid chief advisor to the office of the mayor is conveniently also a registered lobbyist for the winning bidder. This combination is a recipe for disaster, resulting in very long term deals that could be very bad for the public. Long term lease deals can still make sense – if they are done right. The Chicago Skyway and Indiana Toll Road deals were both home runs, for example. But given the enormous risks if something goes wrong, governments must put into a place a robust process for protecting the public, with a full airing and mitigation plan for the bad incentives that populate so many areas of this field. I would strongly encourage people to read the entire Renn article. Will the bullying mentality be checked in the update of our Greenways Master Plan? Two representatives of the Indianapolis Art Center saw fit to write letters to city zoning officials in support of the recent rezoning petition for 5301 Winthrop Ave. to permit a brewery/restaurant and outdoor concert venue. The operation is considered by many near-neighbors as overly intense for the largely residential area. The petitioner’s exhibits for the February 6th MDC hearing contained letters by Ashleigh Graves-Roesler, shown as the Art Center’s Annual Fund Manager, and Patrick Flaherty, Director of Exhibitions and Artist Services. Mr. Flaherty’s address was shown as 4422 Guilford and Ms. Graves-Roesler’s is 5325 Carrollton. The reality is that nearly all of the remonstrators had never opposed any neighborhood re-development or rezoning. But in this time of disingenuous digital commentary, facts are often less important than “free expression” which is a trademark of the arts. Mr. Flaherty doubtless knew his statement was patently false, but his intent was not to clarify or enlighten but to discredit and distract. The Art Center has been taking an aggressive stance in attempting to install art wherever on public property it desires. Thus it’s probable that its two letter writers were actually interested in securing a potential friendly site for public art along the Monon Trail. The Monon greenway as a linear art exhibit isn’t enough for the Art Center, even though it has installed several pieces along it. More recently, the scenic and historic Central Canal has been targeted. Last year, in consort with Midtown, Inc., the Broad Ripple Village Association, and others, it tried to encroach upon the canal with a plan for a series of intrusive public art— to create an “art to art trail”. Fortunately, that attempt, driven largely by perceived entitlement, was checked by Citizens Water which owns the property. Following public outcry and a plea for an open public process for reviewing the siting of art (visit savecentralcanal.wordpress.com), Citizens Water announced in September that the company does not anticipate approving any public art on its canal property. In its push to place art on the canal, the Art Center was not only aggressive, but also contemptuous of community concerns and the public interest. It even publicly, but again falsely, attacked one of the objectors in a letter to The Indianapolis Star. When questioned about the propriety of its plan, it didn’t take long for its bully mentality to be revealed as it resorted to unfounded personal attack in the public media. (The unbecoming penchant for bullying by some art groups was spotlighted by Indianapolis Business Journal columnist Mike Redmond in his criticism of forcible public art-- Forget Elvis on Velvet; Art Bullies Have Other Plans”, 1-15-07). The bigger issue today is the emergence of a development-at-any-cost political machine that has been created in north Indianapolis by a consortium of the Art Center, Midtown, Inc., the Broad Ripple Village Association, Meridian Kessler Neighborhood Association, and other powerful commercial groups. They've mastered the alluring rhetoric of community/walkability/livability, but they actually push economic growth, and their own commercial interests, above all else-- even where the quality of life of the neighbors is needlessly sacrificed. This machine has been consistently encouraged by Mayor Ballard’s office and other administration and Council officials who push economic growth, in part via recent EDA and TIF district designations, regardless of the costs to the community or the near-neighbors. An update to the greenways master plan is currently being prepared by City staff. Some indications are that City administrators might be intent upon commercializing the greenways. Will inappropriate or ubiquitous public art become a permanent brand or blight on our scenic greenways? It will be crucial for neighborhoods to monitor and re-direct this process so that commercial developers and the institutional art bullies are not, in effect, handed the keys to the city. While there might well be locations along the greenways for which commercial development and public art might be beneficial, those decisions must be made carefully and collectively and not in isolation with only the invited institutional “stakeholders”. One of the areas where there was considerable behind the scenes disagreement between Superintendent of Public Instruction Tony Bennett and legislative Republicans in the last couple sessions was in the area of grading schools. Bennett proposed the current A-F grading system. His system leaned heavily on performance as opposed to improvement. As a result, many schools that are on the cutting edge of reform and had experienced dramatic improvement were still be labeled as D or failing schools despite that improvement. Also, because improvement was still being measured as part of the grade, some highly performing public and private schools saw their grades dragged down because they weren't sufficiently improving. A Republican-controlled state Senate committee agreed Wednesday with the new Democratic state schools superintendent that Indiana's A-F grading scale for individual schools should be scraped. The unanimous vote by Senate Education Committee backing Superintendent Glenda Ritz on one of her top campaign issues last year came a day after a House committee approved a bill that would take away from her the administration of the state's private school voucher system. The Senate bill would throw out the A-F grading system that was issued for the first time in 2011 and have the state Board of Education develop a new system for tracking school improvement. About 60 percent of Indiana's more than 2,000 public and private schools received grades of A or B under scores released in October. Several educators testified Wednesday about instances where their schools had consistently high student test scores but received low grades because students hadn't shown enough improvement. Ritz, who took office last month, told the committee that she believed using a single grade for schools wasn't effective when trying to track both student performance and whether they are improving. She said more than 100 schools had appealed their scores but that she couldn't give them clear answers on how the scores were determined. "I'm in favor of reporting out the raw data rather than trying to find some way to combine the score into a grade," Ritz said. "I think we'll have the very same problem of trying to tell people what that grade really represents when we really do have to measure two different things." The A-F scale was backed by Republican Superintendent Tony Bennett — whom Ritz defeated in the November election — despite widespread opposition from teachers and other groups, including the Indiana Chamber of Commerce. No one defended the grading system during Wednesday's hearing on the bill to repeal it. "I've concluded that the current model is flawed and doesn't do what it was intended to do," said Sen. Jim Banks, R-Columbia City. During the campaign, Ritz proposed separating out the two measures of achievement and growth, but instead of A-F wanted a system that labeled the schools as a “reward,” “focus” or “priority” school in each of the two measures. I am not a fan of gobbledygook euphemisms like that which are often used in education. I like the A-F labels. I just don't think you can lump achievement and growth together and hand out a single grade. Click here for an explanation of how the A-F grading system for schools work and what grade each school received. Taxpayers Will Be Asked to Pay for New Orlando Soccer Stadium; Will Indianapolis Be Next? Last month it was announced that investors, lead by local developer Ersa Ozdemir, are bringing minor league soccer to Indianapolis. The team, beginning in 2014, will play in the Michael Carroll Stadium on the IUPUI campus. Another possible location for the team's games that has been talked about is Lucas Oil Stadium. Fiscal conservatives warned though that it was a matter of time before that soccer franchise made a play for a downtown soccer-only stadium built and operated with taxpayer dollars. It was even rumored that the real reason for the 67% increase in admissions tax and 50% increase in the local rental car tax the Capital Improvement Board and City administration pushed through the Indianapolis City-County Council was to provide an influx of cash to the CIB in order to subsidize the soccer franchise. During the announcement, Mr. Ozdemir admitted that that eventually a new downtown soccer stadium would be pursued. Media types though didn't ask tough followup questions such as who would pay for that stadium. A wealthy Brazilian entrepreneur became a major investor in the Orlando City Soccer Club on Friday [February15th], bringing an influx of cash that makes it much more likely that Orlando will land a Major League Soccer franchise — and that taxpayers will help foot the bill for a new soccer stadium. In an exclusive interview with the Orlando Sentinel on Sunday, Orlando City Lions president Phil Rawlins and businessman Flávio Augusto da Silva confirmed that he is now part of the team's ownership group and will eventually be its primary owner. The investment is a major step in the minor league USL Pro team's effort to gain entry into Major League Soccer. At the same time, negotiations are under way between team executives and officials from Orlando and Orange County over building a new $105 million stadium for the team. Taxpayers would pay most of the tab for the 18,000-seat facility. "A soccer-specific stadium is a must for the award of an MLS franchise," said Orlando Mayor Buddy Dyer. •$30 million from the team. •$30 million in state sales taxes. •$25 million in hotel taxes from the county. •$20 million from the city, mostly in land costs. Rawlins defended the use of public dollars for the facility, pointing to a study commissioned by the team that found an MLS team playing in a downtown stadium would produce a $1.3 billion economic impact over 30 years. Under the proposal being discussed, there would be no increase in hotel taxes, he said, and the sales taxes represent money generated by the stadium. "This is a net positive for the community," Rawlins said. Indianapolis taxpayers get ready to hold onto your wallets once again. Soccer is coming to town and you're going to pay for it. My guess is that the stadium will be built on the grounds of the Old Market Square Arena with an attached commercial development also subsidized by taxpayers. Proceeds from the development will undoubtedly go to the owners of the soccer team and not to the public. Yesterday someone posted on Facebook the video produced by Bill Nye "the Science Guy" in which he seeks to explain Climate Change 101. Unfortunately I was heading out the door and didn't have a chance to review and respond to the video. I had time to watch it this morning, but unfortunately my response is going to have to be rather brief brief because I have an early morning deposition. For some reason the embedding doesn't work so here is a link to the video which appears to be produced by the Climate Reality Project. It is apparent that Nye's motivation to produce the video isn't about honest science. Rather it is about political advocacy. 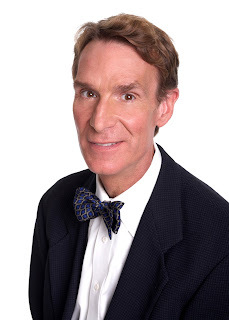 Honest science doesn't demand, as Nye does, to "stop the debate." People who are honest about their scientific conclusions welcome debate. Further, Nye proceeds to demonize anyone who disagrees with him as being funded by the fossil fuel industry. Never mind that there is scientific disagreement with his conclusions from people not funded by the fossil fuel industry. Never mind that Nye completely ignores the role grants have on driving the anthropogenic global warming academic studies. (If you are an academic and apply for a grant for the purpose of producing a study showing anthropogenic global warming is not taking place, you are not going to get the grant.) That Nye's science is about political advocacy is apparent from his conclusions that "clean energy" (while the video shows windmills and solar panels) will create a lot of jobs. Again, scientists need to stick to science and not partake in the political advocacy as Nye clearly is doing. But I've started at the end of the video, let's return to the first. Of course, Nye does the old tactic of calling the danger "climate change" instead of the older bogeyman "global warming." The climate has been changing for 4.5 billion years, going through cycles of warming and cooling that last millions of years if not longer. There is no reason to think this pattern is somehow over. Of course when the numbers weren't working out on the "global warming" scare the alarmists moved to "climate change." Nye declares that the "fundamentals of climate change have been understood for decades." I suppose the "decades" includes the 1970s when scientists, including global warming alarmist James Hansen, was warning of the upcoming ice age. Nye is old enough to remember the 1970s. I wonder if he "understood" the planet was warming then or whether he went along with the "ice age" alarmists back then. Nye goes on to say that excess of CO2 in the atmosphere causes the temperature to rise. Actually studies over and over again have shown that CO2 rises following temperature increases. The cause and effect that Nye wants us to assume is there, is actually the reverse of what he claims. But that doesn't stop Nye. He just ignores those real life studies of our climate to do an experiment in the studio using the assumption that our climate is a closed system. Never mind that people haven't been able to replicate his study. The fact is the cause and effect simply isn't there. Of course, Nye completely leaves out that CO2 levels have been much higher than today in our planet's history, including a period before man walked the Earth. How did that happen? Nye offers no explanation. He just ignores these inconvenient facts. Nye claims that we are having more and more extreme weather that we've never experienced before and this is proof of "climate change." I do find it ironic that liberals can talk about weather being proof of dangerous global warming, but the minute conservatives try to point to weather events disproving global warming, they are scoffed at for not knowing the difference between weather (short term) and climate (long term.) Nonetheless, Nye offers no proof that we are having more extreme weather than ever. He just wants the viewers to assume that is true. As I've written on these pages before, a research meteorologist who supports anthropogenic global warming did a 100 year study of hurricanes expecting to find an increase in activity due to the aforementioned warming. Much to his disdain, he found no proof to support his hypothesis. Near the conclusion of the video, Nye makes the call for action saying that we can "stop climate change." of course, again, the climate always changes. If Nye is talking about climate change as in "global warming," even the most severe measures such as the Kyoto Treaty, even if fully implemented, would barely have a dent on global warming predictions. Of course, Nye doesn't care about any of that. This is about Nye promoting his political agenda, not being honest about the science. Below is the statement by Governor Mike Pence on the budget passed by the Indiana House last week which did not include the 10% income tax cut he proposed. I would note that it is not unrelated to the previous story I wrote about corporate welfare. They both relate to the misguided belief among some elected officials, including many Republicans, that government is better at making decisions on how to spend the public's money than are small businesses and individual taxpayers who otherwise would be keeping those tax dollars. 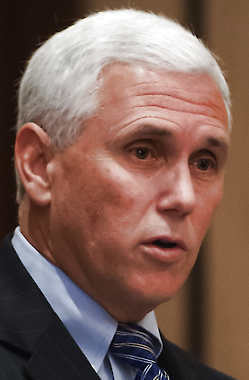 Indianapolis, IN - Governor Pence expressed disappointment with the budget proposed by the Indiana House of Representatives, which increases spending but offers no new tax relief for Hoosiers. He resolved to protect taxpayers in continuing budget negotiations. "I am very disappointed in the House budget proposal. Despite having the largest budget surplus in history, this House budget increases spending without giving hardworking Hoosiers one cent of new tax relief. As our administration's budget clearly showed, we can afford to do both. Indiana can fund our priorities including increases for roads and schools and reduce the personal income tax. Since we can reduce taxes on every Hoosier, we should. "By leaving income tax relief out this early in the process, this House budget proposal does not contain the kind of balanced approach that will create jobs and opportunities for Hoosiers. With so many hurting in this economy, Hoosiers deserve better. Indiana recently cut taxes for businesses and estates. It's time for average Hoosiers to get a break. "And income tax relief will create jobs. By allowing small businesses to keep more of what they make, we will make Indiana more attractive for investment. Our state is in a race for jobs with states across the country, many of which are reducing and reforming income taxes. Not only can we in Indiana afford to offer tax relief, we can't afford not to. If we stand still, Indiana will lose. "It is still early in the legislative session. House leaders have committed to me that an income tax cut for middle class Hoosier families is still possible in this session. I take them at their word, and Hoosiers have my word. I will continue to fight to pass a balanced budget that meets our needs, funds our roads and schools, strengthens our reserves and lets hardworking Hoosiers keep more of what they earn," said Pence. Corporate welfare refers to government favoring certain businesses through tax and other fiscal policies, even going so far as to hand out direct taxpayer subsidies, to those favored businesses. Local examples include handing a billionaire sports owner $33.5 million for his professional basketball team and giving a politically connected developer $6.35 million to build a parking garage/commercial center for which the developer gets 100% ownership and 100% of the revenue. Or it could mean something more simple, such as bending zoning rules, handing out tax abatements, or adopting regulations that limit competition. 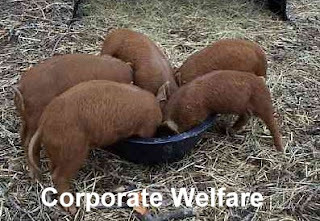 Bottom line is that the idea of corporate welfare is that government and not the market knows best. Economists universally reject the notion that politicians are better at picking winners and losers than the free market. Voters likewise overwhelmingly reject corporate welfare. Yet politicians, both Republicans and Democrats have increasingly embraced it while turning a deaf ear to the increasing public complaints about giveaways of their tax dollars to business interests. The disconnect between the corporate welfare policies politicians vote for and what the public wants recently led to the rise of two populist movements, the Tea Party and Occupy Movement. 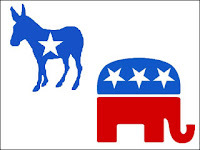 Although far separated on the political spectrum, these two groups were actually in complete agreement in their opposition to corporate welfare. Although corporate welfare as policy has increasingly been embraced by elected officials, the debate has been going on since the United States became a country. 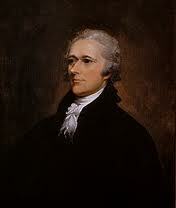 Alexander Hamilton, a Founding Father and first Secretary of the Treasury who gave us our monetary system, believed strongly in central planning of our economy and corporate welfare, then called "mercantilism." As part of that belief, he believed that government should subsidize certain businesses over other businesses. Hamilton also though debt and a national bank were a good thing. 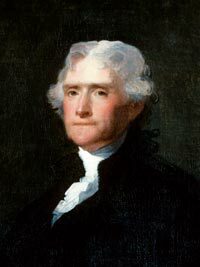 Thomas Jefferson, who opposed those views defeated President John Adams in the 1800 election. Adams, like Hamilton, was a Federalist. Jefferson's views were shaped by Adam Smith's Wealth of Nations which was first published in 1776. Jefferson did not believe in central planning of the economy. Rather he believed in free markets and, did not think government should subsidize businesses the politicians favor. As a result, argues DeHaven: “corporate welfare often subsidizes failing and mismanaged businesses and induces firms to spend more time on lobbying rather than on making better products. Instead of correcting market failures, federal subsidies misallocate resources and introduce government failures into the marketplace.” That is, government intervention in the name of fixing private problems almost always exacerbates private problems. Upsetting the competitive balance hurts the rest of us. For instance, federal water subsidies “encourage farmers to grow crops in areas where it is inefficient or unsuitable to do so,” notes DeHaven. That’s not only financially wasteful; it also is environmentally destructive. That is just one example of the massive distortions caused by corporate welfare. Among the worst were pervasive housing subsidies, which flooded the industry with money. When the federally-inflated bubble finally burst, the entire economy crashed in 2008. Moreover, corporate welfare politicizes the economy. Washington’s economic policy never has been genuine laissez faire. Indeed, in the new republic Alexander Hamilton was not alone in promoting corporate welfare before there were modern corporations. But the problem has exploded as government has expanded. Observes DeHaven: “The more that the government intervenes in the economy, the more lobbying activity is generated. The more subsidies that it hands out to businesses, the more pressure lawmakers face to hand out new and larger subsidies. As the ranks of lobbyists grow, more economic decisions are made on the basis of politics.” And the more we all pay. Ironically, while the Left tends to rail against special interests and their role in election campaigns, its support for ever larger government inevitably enhances the role of special interests and their role in election campaigns. If government is actively enriching and destroying companies and entire industries, they have a right to influence government. The more booty that is available for political winners, the more business will spend and the harder it will fight to achieve victory. Unfortunately, corporate welfare has proved to be resilient even in the face of pressure to cut a trillion dollar plus deficit. As Public Choice economics observes, concentrated interests organize to defeat the diffuse public interest. So it is with business subsidies. Those benefiting from federal largesse work very hard to keep their ill-gotten gains. But America can no longer afford politics as usual. Washington’s finances are in crisis. Only a ruthless assault on unnecessary spending will stop the U.S. from eventually becoming Greece or worse. A good place to start cutting federal outlays is money for dependent corporations. Although the lengthy Forbes article focuses on corporate welfare at the national level, the arguments are equally applicable to the state and local level. In short, the Forbes article makes this point: the institutional structure of our political system creates an environment where corporate welfare flourishes despite popular opposition from the right and left to the as well as intellectual opposition from economists and other academics who see the policy as terribly flawed. But therein also lies a political opportunity. One area where voters on the right and left strongly agree is that our hard-earned tax dollars should not be handed out to favored corporations and businesses interests. It doesn't matter that down the road, conservatives would want the money returned to taxpayers and liberals want the money spent on social welfare programs, that is a battle far down the road. Right now the battle is to stop the corporate giveaways which have played no small role in our federal budget deficit, and increased spending at the state and local level. On that issue voters on the right and left are united against what our politicians are doing. A skillful politician, seeing the voters' overwhelming opposition to corporate welfare, could use it as the issue to propel himself or herself to enormous popularity and as high an office as President of the United States. The Forbes article can be found here. A paper authored by DeHaven titled "Corporate Welfare in the Federal Budget," which is discussed extensively in the Forbes article can be found here. As a result of the 2011 municipal elections, the Democrats won a 16-13 majority on the Indianapolis City-County Council. Before that election took place, Council President Ryan Vaughn quietly hired political operative David Brooks to draw new precincts and council district maps. On December 19, 2011, the resulting redistricting ordinance, Proposal 353, was passed by the lame duck council on a partisan vote. On January 1, 2012, re-elected Indianapolis Mayor Greg Ballard signed the ordinance into law. Indiana law requires that the council redistrict in the second year after the census. The council can do it during other times, but they must redistrict in that second year, in 2012. Republicans claim the requirement was satisfied because the mayor signed the ordinance in 2012. The Democrats argue otherwise and as 2012 wound down passed their own map which was vetoed by the Mayor. This week, Council President Maggie Lewis and two other Democrats filed a legal challenge to the districts drawn by Brooks and asked that the court adopt theirs in its place. An interesting legal issue no doubt, but it turns out that lurking in the shadows could be a much bigger legal issue, an issue that may doom the Republican council maps before the first courtroom salvo is fired. Needless to say, this is not the first time an error was made in a measure passed by a legislative body. Legislation is passed all the time to fix errors that happen, which happen frequently when legislation is rushed. The problem here though is control of the council chamber switched from the Republican Party to the Democrats shortly after passing the ordinance. Obviously the Democratic council majority is not going to pass legislation to fix the Republican error. The only possible saving grace I can think of is if, in addition to adopting the faulty ordinance, the council also officially voted on and adopted the maps themselves as part of the Republican redistricting ordinance. That way they could at least they could argue to the court that the maps and not the formal ordinance controls. I reviewed the video and it appears they only voted on the ordinance. Even if the Republicans council map stands, it may not prove to be as favorable to Republicans as both parties think. The Brooks' districts purport to create 15 Republican districts. That is a sizable 15-10 district advantage in a county that has a Democratic baseline of about 60%. Even if the Democrats sweep the four at-large districts, the Republicans would have a 15-14 majority on the council if the Brooks' baseline holds. Knowing the practical limits of redistricting, I have always been very skeptical that such a favorable map could be drawn for Republicans within the confines of Marion County. There just aren't enough Republicans, in particular on the more populous northside of the city. Further, the less populated southern townships are the only remaining Republican stronghold in Marion County. That led me to take another look at those council districts using 2012 election data. In getting the Republican baseline, and concluding 15 of the 25 districts had a majority of Republican votes, Brooks used the 2010 Marion County Recorder's race. That head-to-head challenge was won by the Democrat 55.47% to 44.53%. In 2012, the Republican baseline continued to deteriorate. I used the Marion County Surveyor's race which was won by the Democrat 61.79% to 38.21%. The recorder and surveyor races are those political analysts typically use to create a baseline as very few people know candidates for those offices so they are more likely to vote their party preference. Of course turnout every election is different. 2012 was a presidential election year with much higher turnout. One would think that with President Obama on the ticket, Democratic turnout might be better in Marion County and thus influence a down ballot race used to determine a baseline. But it makes sense that that would be turnout increasing substantially in the Democratic areas of the county, not in most of those Republican majority council districts. A Senate Bill to sunset the CIB tax increases recently passed by the Indianapolis City-County Council yesterday passed out of the Senate 37-12 and is on the way to the House. A couple weeks ago, the Indianapolis City-County Council by not coincidentally a vote of 8 Republicans and 8 Democrats on each tax proposal, voted to increase the admissions tax on events held at facilities run by the Capital Improvement Board (CIB) by 67% and the local car rental tax by 50%. In 2009, when the Indiana General Assembly gave the authority to raise these two taxes to the Council, they expressly indicated that the taxes would only be increased if necessary to pay back a state loan of $18 million for which principle payments are due beginning this year.. Four years later the CIB is flush with cash and the decision was made to raise the taxes anyway, in fact to max out the taxes, and pour 75% of the new revenue into the CIB's coffers. The increased taxes, which are expected to raise $6.7 million a year, will elevate Indianapolis to the third highest visitor taxes in the country, behind only Chicago and New York City. In a story that appears that only my blog is following, Senator Michael Young (R-Indianapolis) took notice of what was going on on the other side of Market Street and introduced a bill, Senate Bill 90, to sunset the taxes after 10 years, the period of time the City has to pay back the loan, for which principal payments are due beginning this year. Indianapolis and CIB officials were none too pleased with Young's bill.. They testified testified against the bill in committee and urged its defeat. But the bill passed 8-2. What is most interesting is the Senators who lined up to co-author the bill. Brent Waltz, Mike Delph, Michael Crider, Pat Miller, Scott Schneider, as well as the previously mentioned Michael Young, are all Republicans with portions or all of their district in Marion County. That all these Republicans are willing to stand up and oppose tax increases pushed by Republican Mayor Greg Ballard and the CIB filled with his appointments is a significant development. It remains to be seen whether SB 90 will garner as much support from the Marion County Republicans as it moves to the House. After the election of 2012, Indiana Republicans had a lot to celebrate. They gained super majorities in both houses of the Indiana legislature while electing a Republican Governor and re-electing a Republican Attorney General. On the federal level, the Republicans won 7 out of 9 congressional seats. The only tarnish on an otherwise excellent night for Indiana Republicans was the surprise upset of Tony Bennett, in his bid to be re-elected Superintendent of Public Instruction. But for Indiana Republicans there are clouds on the horizon and that horizon is in Marion County, Indianapolis. Once a bastion of Republican votes that a statewide Republican candidate could count on, the state's most populous county has in the past decade reversed direction to give majorities to Democrats. It is essential to the future success of statewide success that GOP candidates do not come out of Marion County in such a hole that they can't climb out. I wanted to take a look at how the Republicans were faring in Marion County. Unlike the media which focuses on major races, a proper political analysis involves looking at low profile races to get an all important "baseline" number. Despite the claim, "I vote for the candidate not the party," the fact is many people do not know the candidates in low profile races, races like County Recorder and County Surveyor. In those races, people tend to default to their party preference. A baseline is just that - a baseline. Popular candidates run above the baseline. Unpopular candidates run below the baseline. But the baseline is the starting point and is critical to measuring one's chances to get elected. You can only run so far above the baseline. If a Republican is running for a seat with a GOP baseline of 25%, he or she can be extremely popular, and even very well-funded, yet never get close to hitting that magical 50% + 1 threshold. It is also important that in doing a base line analysis that you compare apples to apples and oranges to oranges. Because Presidential election years have higher turnout you don't compare them to mid-term elections. Also, there are occasionally elections where a very popular candidate at the top of the ticket so affects turnout that the baseline gets It's an inexact science to say the least. In Presidential Election years, when the Governor is on the ballot, the baseline in Marion County has dropped nearly 12% in 12 years. As of 2012, that translates into a baseline hole of 79,579 for Republicans in Marion County. 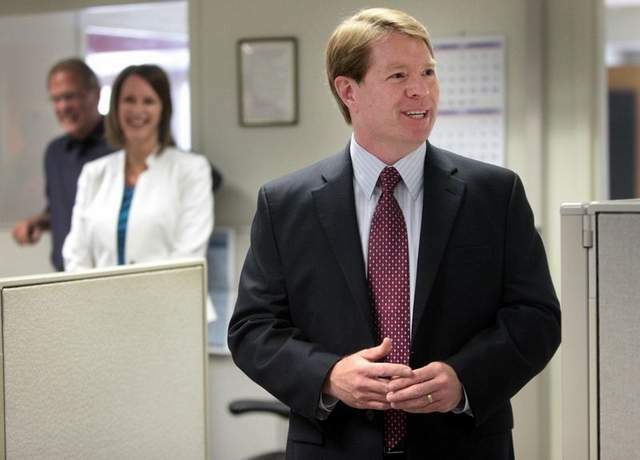 In Mid-Term Election Years, the baseline in Marion County has dropped 8.5% in 12 years. In 2010, that translated into a 73,062 vote hole for Republicans in Marion County. These numbers are to be taken with a grain of salt. For example, 2010 was an unusually good year for Republicans, even in Marion County. My guess is that 44.53% baseline in 2010 is inflated a couple points. Also, the 2008 and 2012 elections featured Barack Obama at the top of the ticket. His presence undoubtedly increased minority and Democratic turnout in Marion County a bit higher than it otherwise would. So my guess is the 2008 and 2012 baselines are maybe a point or two above what is reflected. Finally, in 1998 and 2000 there were races where there was a Libertarian candidate involved in the race I used for the baseline. Contrary to what my Libertarian friends claim, Libertarian candidates tend to draw more from Republican candidates than Democratic candidates. So the presence of Libertarian candidates in those races probably depressed the Republican baseline numbers a bit. But those caveats aside, the trends in Marion County are undeniable and it should be a warning for Republicans seeking statewide office. Marion County is going to leave you in a hole and that hole is getting bigger every year.